The sun was out but there was still a nip in the air and the wind was brisk for Tuesday night's dual meet against Janesville Parker. The JMM boys & girls track & field teams took on Big 8 rivals in their second dual meet of the outdoor season. Athletes continue to try new events and progress is being shown by both varsity and junior varsity athletes alike. In the team battle the girls lost to Parker 83 to 63 and the boys loss in a close battle 74 to 72. Both teams were a little short handed and hope to get more athletes back as they move forward in the season. It is important for EVERYONE to take care of their bodies, get good grades in the classroom, and be at practice every day. We look forward to continuous improvement as we close out the month of April. Look for ways to improve at every practice and every meet. Encourage your teammates to reach their highest potentials. Together this team can accomplish some great things in the coming weeks. 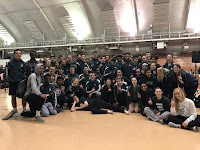 The season starts to get busy with multiple meets each week...make sure you are staying caught up on classroom work and you are communicating with your event coaches about which days you will be competing and/or practicing.